Indianola is a college town nestled in the rolling hills of Warren County, Iowa and is part of the Des Moines metro area. The town has a population of 14,300 and is the seat of government of the 4th fastest growing county in Iowa. Indianola is only 20 minutes from the Des Moines International Airport and downtown Des Moines, the state’s largest business center and seat of government. Residents in Indianola have all the benefits of a smaller community with access to big cities amenities of Des Moines metro area. Indianola is also noted for its great public schools, Simpson College, the Des Moines Metro Opera and the National Balloon Classic. Simpson College is a private college founded in 1860 with about 2,000 students. The Des Moines Metro Opera was founded in 1973, performs every summer and has been called a national treasure. 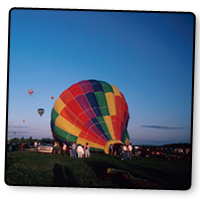 The National Balloon Classic is the nation’s second oldest and second longest hot-air balloon event in the United States.